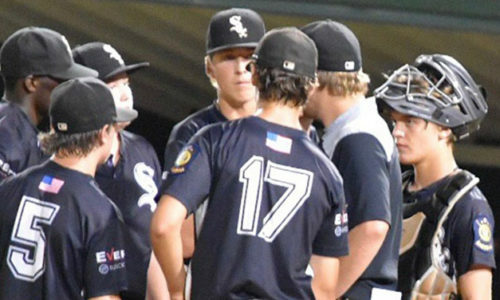 CONWAY — Noah Davis and Ryan Riggs each had two hits and Davis drove in three as the Bryant Black Sox Junior American Legion team built a 9-0 lead over three innings on the way to a 14-4 rout of Greenbrier/Southside in the opening round of the 2018 Junior Legion State Tournament at Hendrix College on Friday. Bryant advanced to take on Texarkana at 1:30 p.m. on Saturday. Texarkana advanced with a 13-1 win over the Brinkley Patriots. In the other first-round games, Benton Sport Shop edged the Russellville Pirates, 9-8, while Jacksonville Gwatney Chevrolet ripped the El Dorado Drillers, 13-1. Bryant and Texarkana played twice during the regular season and each had a win. Will Hathcote picked up the win on the mound, pitching three of the five innings in the Black Sox’ victory. Josh Turner worked the fourth and fifth, surrendering four unearned runs on five hits. Those five runs came in the top of the fifth as Greenbrier cut the Bryant lead to 9-4 but the Sox scored five in the home fifth to make it a run-rule victory. The scoring started in the bottom of the first. Davis led off with a double but was thrown out at third trying to stretch it to a triple. But Brayden Lester was hit by a 1-1 delivery and, with two away, Riggs drew a walk. Gage Stark drew a free pass to load the bases and Slade Renfrow cracked an RBI single to left to make it 2-0. Hathcote pitched out of a base-loaded, one-out jam in the top of the second, picking up a strikeout and ending the frame with a groundout to Davis at short. A balk allowed Andrews to score then, with two away, Riggs lined a single to center to make it 5-0. Renfrow greeted a new pitcher to start the home third with a free pass. Zion Collins got a sacrifice bunt down then Hathcote hit a shot to short that was kicked, along Renfrow to score. Speer walked then stole second ahead of Davis’ two-run triple to center that made it 8-0. Lester singled in Davis to cap the inning. Turner relieved for Bryant in the top of the fourth. He surrendered a two-out single but kept Greenbrier off the board. The four-run Greenbrier fifth started with an error. After a pair of singles, another Bryant error made it 9-1. An RBI single followed and, with two away, a single to left made it 9-4. The win-clinching outburst in the bottom of the fifth began with Lester getting struck by a 1-0 pitch. After a pitching change, Peyton Dillon doubled to make it 10-4. Riggs singled then Stark delivered a run with a sacrifice fly. Renfrow walked then followed courtesy runner Tyler Bates on a double steal ahead of Collins’ two-run double and a 13-4 advantage. Walks to Turner and Speer had the bases loaded so the Sox walked it off when Davis drew a free pass that forced in the final run.